As you all know, our oldest son got married, had a baby and they moved in their new home last Spring. Before that, his room sat empty the whole five years he was in Navy and he only used it when he came home on leave. This is what his room looked like. This is what the room looks like now. I looked for a comforter set for a while. Didn't want to spend a small fortune to make these changes. One day I went to Ross looking for a basket and came home with no basket and new bedding for this room. It was a ten piece set for $34.99. It even included a queen size coverlet and I loved the embroidery details. Could not leave it behind! Later on, one day browsing online, I found out it was a Macy's closeout and the original price for this set was $320.00. Little by little, the room started to come together. wing back chair we reupholstered using drop cloth. You can see that post here. 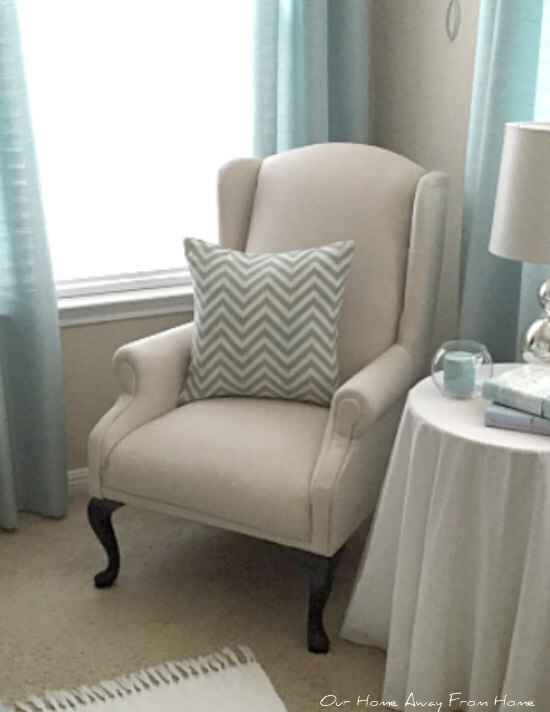 The chevron pillow cover I bought at Hobby Lobby for $2.00. The drapes I also bought at Kirklands. They are really good quality and the color is beautiful in person. On the other side of the room I kept his media cabinet since it also has a lot of large drawers to store clothing. I didn't know how to decorate the wall over the bed, I looked around for a while but nothing caught my eye. At the end, I asked my husband to build me a small window using two fence boards we had in the garage. I painted it using Heirloom White, made a small "Home" sign to place over it with the leftover piece of the fence boards and added a small boxwood wreath for a pop of color. And that is all I have done until now. I don't know if I will make any changes, you all know how that is, :) but for now I am enjoying the new look. I want to thank you for your visit and comments. They mean the world to me! Thank you! I can get all the pictures ready. Ilove it, so pretty and that bedding is stunning. Great find. Good Morning Maria, Your room looks lovely. It was very nice before, but heavy and masculine, now it is so bright and fresh. I can almost smell sun dried linens and fresh spring air, just from the light colors and patterns in the room. Beautiful job! Oh my goodness, Maria! It looks great!!! I can't believe the deal you got on the bedding! Love how you decorated over the bed and those baskets fit perfectly in the media cabinet! Such a beautiful room! Wow!! I am blown away by the transformation! It looks just super. I am so impressed with the chair redo, too! Amazing!! Wow Maria that was quite the buy! That pillow cover works perfectly too and the drapes are really pretty. You did a great job of creating a guest room. Mine will rarely get used but somehow it seems like the right thing to do in having one. Somehow that bed looks larger now- it must be the layout of the bedding that helps. Great job! This is a gorgeous room, Maria! It looks so soft and warm with the pretty comforter (and wow, what a deal), and the white accents. I've never been in Ross but I hear such great things, I will be going soon. The drapes are also beautiful and the reupholstered chair looks brand new! How lucky you are to have a handy husband...love the window and boxwood wreath. How cozy...it looks like a totally new room. Cab't wait to see what you've done in your family room! Love everything you have done! Beautiful room. The bed set is a steal. I l o v e the new changes within your new Guest Room, dear friend! 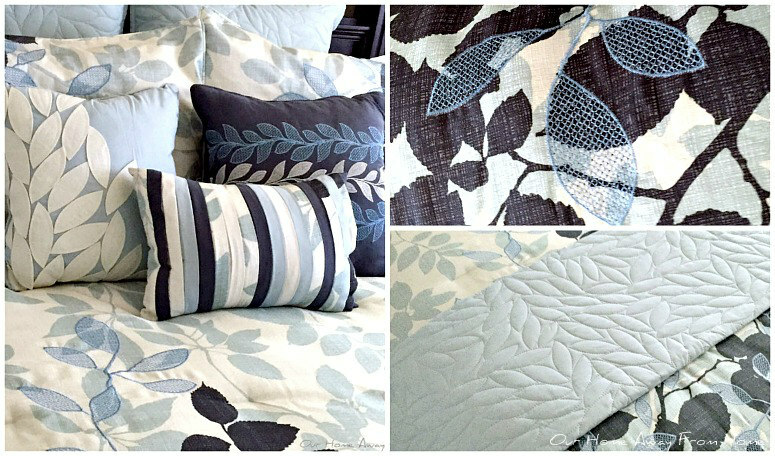 The pattern of your bedding is very serene. . .good for a great night's rest! The color palette is relaxing and gorgeous as are the draperies! I have difficultly finding draperies with tab backs! Purchasing nice drapery rods a few years ago, I prefer to slide mine across the pole. 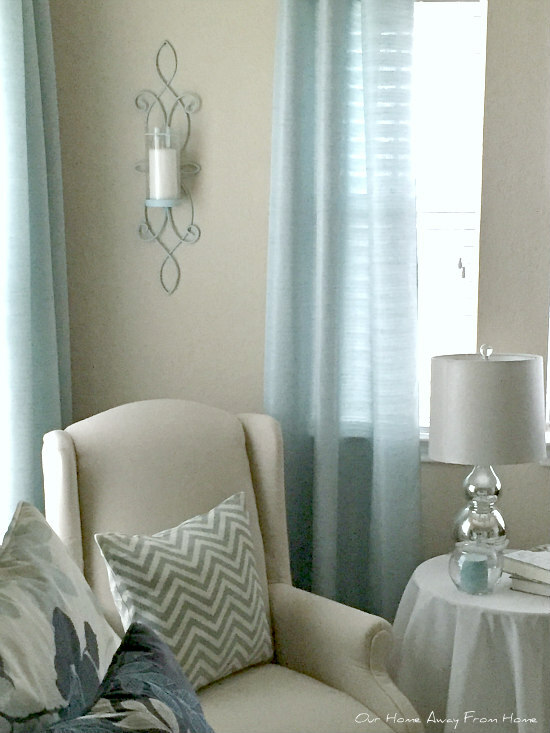 Thank you for sharing this lovely Spring refreshed Guest Room make~over! Your newly decorated room looks fantastic. I love the colors you used. Your husband did an amazing job with the window frame as well. I just LOVE your new bedding! The whole room looks beautiful. I love the fresh light blue color you introduced. The drapes coordinate perfectly with the bedding too. Anyone would be very happy to stay in that room. Great job! Lovely room.....the bedding and drapes are so pretty! You are talented Maria Elena!! Beautiful room! Gorgeous! Such a beautiful retreat...lovely!